One of the most common complaints in homes and multi-residential buildings concerns noise from the waste pipes when drainage occurs. PVC and other pipes radiate noise into the ceiling or wall cavity that can disturb the quiet enjoyment of our homes, especially at night. Noisebar5 combines 25mm convoluted acoustic foam with high performance 5kg/m2 loaded polymer barrier-foil faced. 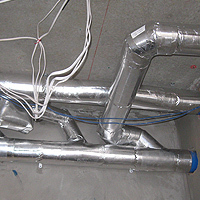 The Building Code of Australia, BCA, now sets the standard for noise emissions from the waste pipes in buildings. Noisebar5 flatpacks are a quick and inexpensive system designed to meet these rigorous standards. Insultape Reinforced aluminium, high tach, insulation tape, 48mm and 72mm wide x 50m long to seal flatpacks. Noisebar Flatpacks are precut straights, bends, traps and gully pieces that are very quick and easy to fit. This saves labour time and cost. Roll sizes 3000mm x 1350mm wide. Precut “Flat Pack” parts available for all PVC pipe and fittings.. Weighted Sound Reduction Index (Rw+Ctr) not less than 40 if the adjacent room is a habitable room (other than a kitchen) 25 if the adjacent room is a kitchen or non- habitable room. Test Results available on request.